Figure 53 | Notes | We just set our salaries by... voting? We just set our salaries by... voting? The fun (and terrifying) thing about running a company is that you're allowed to do... anything. Within the boundaries of the law, every choice is yours to make, and every choice must be made — either by consideration or by default. For example: salaries. How do you set a salary? How does anyone set a salary? It's one of the millions of questions you never knew you didn't think about until you have to do it yourself. The employees aren't on the same team as each other — some got one number, some got another. Who got more? Who is winning? But if not that, what? Another small software shop, Balsamiq, famously pays "a little better than someone with your same job in your geographical area." But when the question first came up for me (when I hired my first teammate), I didn't know how to reliably compute that number, and it felt overly complex for that moment in time. It was just my buddy Sean, we were doing exactly the same kind of work, so, well, let's just get paid the same, right? As Figure 53 has grown, the question of salary didn't get any easier. For a while I went by the guideline "ask them what they want, then offer a little more". It was a nice surprise, and it showed right off the bat that we were on the same team. In addition, I tried to make sure I was never the highest paid employee at the company. I was sometimes paid the same, or sometimes less, but never more. That helped align my interests to those of everyone else; I don't get paid more unless you do, and if I'm making a Big Boss Decision, you can have some confidence that I'm making it in our collective interest. For the last seven years that approach seemed to work okay. Not perfect, but not bad, either. A few things happened in 2013 that led to this moment. First, the salaries of our current team have all settled down to a single number, across the board. We don't all do the same job, but everyone has something special and rare to bring to the table, and it's codified in a completely flat pay structure. This wouldn't fit every team, but it's handy that it fits us now because it makes life easy and transparent. If we're making lots of money, I can't hide it. If we're not making lots of money, I can't hide it. I want people to know if we're succeeding, both because that's exciting and because they deserve to know how much their work is paying off (and evaluate whether they're receiving a fair share of that success). I also want people to know if we're failing, because the most horrifying thing about hiring people is the idea that you might some day need to ask them to find a new job. If that ever happens, I want us all to see it coming ten miles away. No surprises. Finally, 2013 is turning out to be a good year for us, in terms of revenue. How good? Well, this year we shipped a big update to our flagship product QLab. 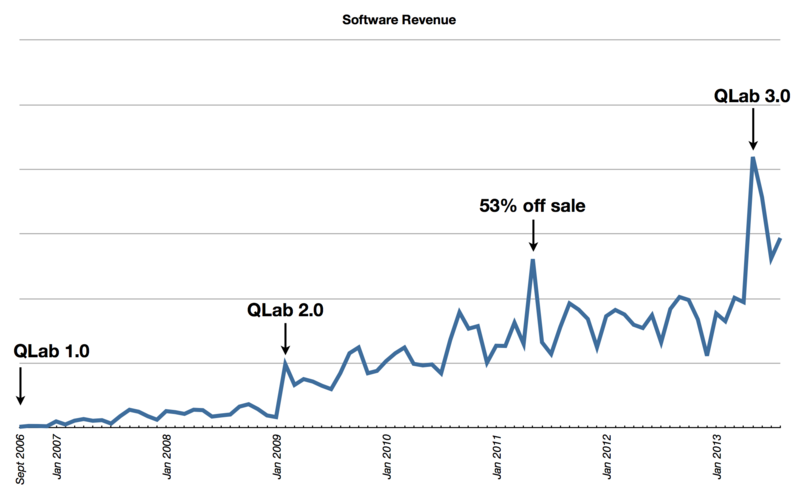 The result is that a few days ago we surpassed the total revenue we made during all of 2012. And the busy part of our sales seasons starts...now. So here we are, the whole team just worked their butts off to ship this update, and all that hard work is finally paying off. It took me a while to get my head above water after the launch, but when I did, I realized the landscape had changed. I had new resources at my disposal, but I also had a responsibility to reward the people who'd made it happen. That's the way it's supposed to go; if you work hard, and you succeed, you get to enjoy the result. It was time to give everyone a raise. But how? I could just... pick a number. I thought maybe that's what I should do. It'd be fun, maybe I'd surprise everyone. But I've also been thinking a lot about shared ownership. I started this company, and I spent a lot of time getting it up and running. But it's not really my company anymore. Legally, I own it. But it's bigger than me, and thank goodness for that. Bigger in talent, bigger in vision, bigger in capacity, bigger in skill, bigger in responsibility. Let's see what happens if I ask people to choose their own salaries. Let's have people give themselves their own raises. Why not? It's a small team. I know everyone well. I regularly share the operational details. I trust them to make a choice that is good for them and good for the company. We're on the same team. Right? I knew all this, but I also won't pretend I wasn't a little nervous about it. I sent it to everyone, told them I'd take the average of the result, and waited to see what I'd get. First, it actually, you know, worked. When asked to pick a salary, we picked one that fit the budget. I ran the numbers, I shared that process with the team, and concluded that, yes, this new number could fit. I explained the potential tradeoffs, opened the floor to non-anonymous discussion, and said I was prepared to sign off on this new number. Second, and most interesting to me, is the gap. See, I voted the number I was thinking of choosing, if I had just done it on my own. And I got quite close to the final number. But it wasn't exactly the same, and I find that gap between my vote and the average vote terribly interesting. What does it represent? Does it mean, given the opportunity, I'd lean low, and they'd lean high, in an effort to pull the numbers in a selfish direction? Maybe. It could mean that. I don't really have the data to know. At the moment, I prefer to think of it as representing a communication gap. Something between my understanding of the state of the company and their understanding of the state of the company placed their valuation just slightly higher than the number I chose. Not much higher, so if I'd just picked a number on my own and declared it by virtue of authority, I doubt anyone would have complained. But doing that may well have covered up a gap in our shared understanding of the company. The kind of thing that might have been unhealthy over time. I suspect, anyway. Again, I don't really know. It's just one experiment. But I do find it interesting. And in the end, I was quite happy we did the experiment. Starting Monday, we get the new salary we voted on. I hope — and I suspect — it's one that means something more than just a raise. I was invited to discuss this post on the BBC Radio program Business Matters. You can find a recording of the broadcast on their site. I join the program about 15-20 minutes in, and then remain as a guest through to the end.